ST. GEORGE — As they ran by the signs protesting the alcohol and drug treatment facility, the group acted unaffected. They didn’t tear them out or stomp on the yards that contained them. They ran right by them. The runners’ lives had all been touched by addiction in some way – either themselves or a loved one; and through treatment and support, they have gone from addict to athlete, which is what Blu Robinson decided to call his organization: Addict II Athlete. In January, some Bloomington residents protested the opening of the residential drug and alcohol treatment home in their neighborhood. Some residents were concerned regarding the character of the people enrolled in the facility, impact the facility would have on property values and overall effects a commercial business would have on a primarily residential zone. Before their run through Bloomington, Robinson prepped his runners by telling them about the signs they would see and why they chose this neighborhood. 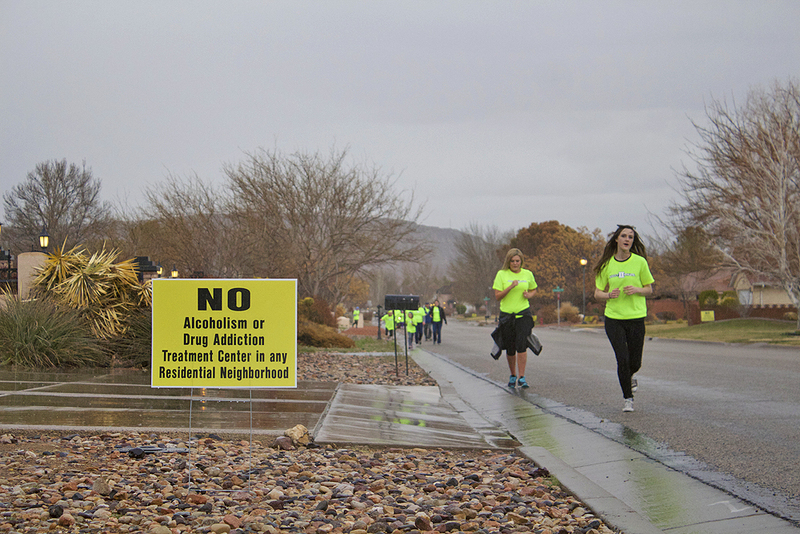 One runner in the group said that she went to a Steps Rehabilitation center, the same organization that has come to Bloomington, but at a different location in northern Utah. “We are not here on behalf of Steps, but we are here because we have that in common,” Robinson said. “I noticed there are a lot of people out here that have protest signs out and I still think that people just don’t know who we are. 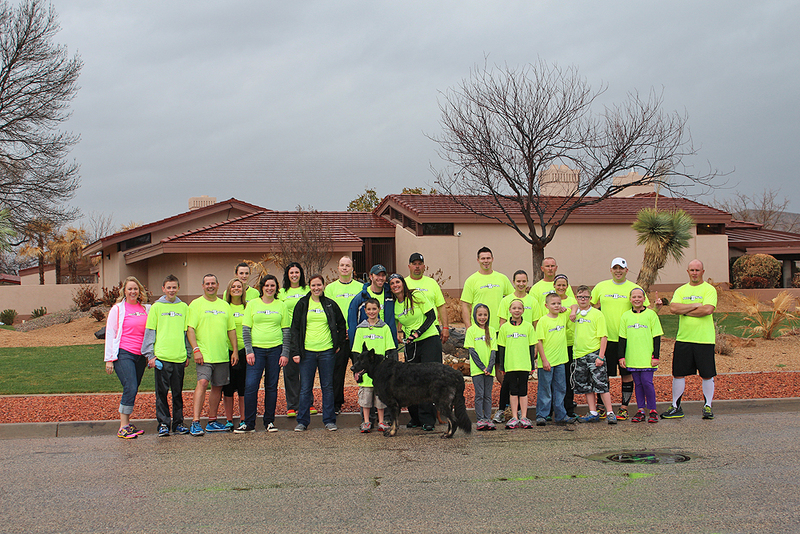 The group jogged about 2 miles, in preparation for their race on Saturday, Lake to Lake Relay in the St. George area, where each team will run 50 miles as a relay from Gunlock Reservoir to Sand Hollow Reservoir. Addict II Athlete put together over six teams for the race, one of which is comprised of children 12 years and under, whose parents had suffered with addiction. Since its conception in 2011, Addict II Athlete has grown to over 400 athletes participating in healthy recreation all over Utah. Robinson is a therapist working for Utah County Division of Substance Abuse who overcame his own addiction by replacing it with things of greater value. The goal of the group is to establish and maintain sobriety in the community by promoting lifestyle changes to erasing addiction and replacing it with something of greater value. Congratulations athletes , addiction is a hard taught battle. Notes to : About the author: many many women do this and much more in a day. I raised 4 children, none got pregnant, did drugs or was a drain on society. They are all college educated with all having multiple degrees or continuing to get an additional degree. They are very close to me and I worked , went to their school functions and sporting activities. It’s called being a mother. Congratulations on your self indulgent mother of the year award. Many parents have raised their kids to be everything they weren’t and have many accomplishments. However, sometimes one kid in that family chooses a different path. That situation becomes very stressful for the parents and siblings because they just don’t understand it due to the way they were raised. Hopefully none of your family or grand kids struggle with addiction. It will be a very hard fall when a leg gets kicked out from your pedestal. As the aunt of a recovering addict, Addict to Athletes has played a huge role in his recovery in Colorado. What an awesome program for these people, people like you and me, any of us! To those protesting this facility, shame on you! I pray you never have to face the horrid face of addiction within yourselves or a loved one!! These addicts are someones daughter, son, grandchild, nephew, niece, mom, dad…….a son or daughter of God!! God Bless all the addicts and families, you have my prayers and support!!! I commend all who responded to this article. We All, have to lean a helping hand to those who need assistance to get their lives back to normal and start feeling good about themselves. But, I think your missing the point concerning the current situation in the Bloomington neighborhood. And remember, the need is growing fast for additional places to house the lost souls. Do any of the readers and good neighbors have a spare bedroom? Maybe your neighbor have a extra room. Let them speak up. (i.e., talk is cheap- put your money where your mouth at). (note) I do not live in that neighborhood. Mike Jorgensen, the owner of the Bloomington rehab center, did not build this facility out of the goodness of his heart. He did it to make money, plain and simple. The cost for treatment at one of his Steps Rehab centers is extremely high, higher than 99% of local residents can afford. He is not aiming at locals as potential clients. He is trying to attract wealthy L.A. and Vegas residents. There is nothing altruistic about his motives. Well we can’t all be Mormons. Oh wait, they take 10% of the gross annual ioncome from every single one of it’s members. If the members do not pay 10%, they cannot do certain things like get married in the temple. To be fair, Part of that 10% goes to humanitarian aide of many kinds. Mike Jorgenson uses the money paid to help heal people. The Mormon church donated MILLIONS of dollars in 2008 to stop equal marriage in Californiaand continues to donate money to unconstitutional causes like the one that recently failed in Arizona. Chris I don’t know if you’re Mormon or not and I don’t care, This comment will hopefully get the majority of people around here to think about where that 10% is really going. So…….your comment means some of that 10% is going to the rehab in Bloomington? I guess that’s what you’re saying because these comments are for a particular story which appears above these comments. My son who works in Utah, has a family and has worked for the same company for over 15 years had an addiction problem. He went to Steps for an addiction and has been clean and happy for over a year. Didn’t lose his family, didn’t lose his job and didn’t hurt the neighborhood. The cost was no more than other good facilities and their main concern at Steps was him getting better, not money. In fact offered him a way to get the help and save money. They also followed up after he left the center for no charge. Not EVERYONE values money more than helping another person in need! I’ll bet the “good residents” of Bloomingidiots just crapped all over themselves, when they saw these folks running down “Their” street! I’ll bet they thought they were being invaded with a full fledged riot! ROFLMAO!